September is National Head Lice Awareness month, in recognition of the time of year when reported cases of lice infestation soar as children leave summer camp and head back to school. There are few things more distressing to a parent then getting a call from the school nurse reporting that your child has head lice. Cootie Catchers is Saudi Arabia’s Premier Head Lice Treatment and Removal service that specializes in the safe screening and effective removal of head lice, using 100% natural products. Cootie Catchers is also the only Saudi Arabia head lice removal service certified to use the “LouseBuster,” which is the first FDA-cleared medical device to treat head lice and louse eggs (nits). Rather than the more well-known method of simply shampooing lice away, Cootie Catchers uses the LouseBuster, which is similar to a blow dryer with a diffuser-like tip. 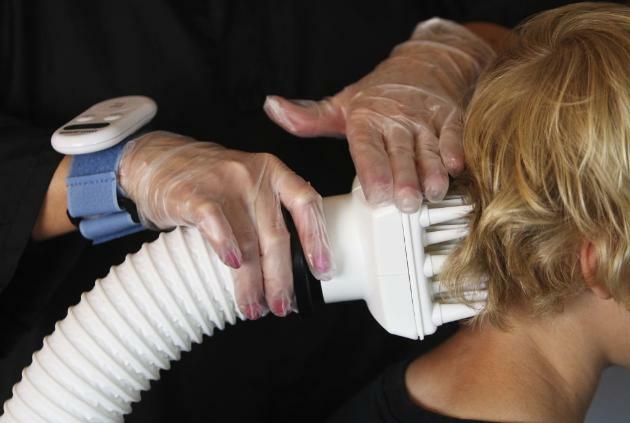 The device generates enough heat to kill lice and nits, yet operates at a lower temperature than blow dryers. After using the LouseBuster device, the treatment is followed by a “comb-through,” using a fine-tooth louse comb to rid the scalp and hair of lice and nits. Intisar Umm Adam is the Lice Lady of Arabia , founder and sole proprietor of Cootie Catchers, Saudi Arabia’s Premier Head Lice Treatment and Removal Service. Delivering the best possible lice treatment to families is our mission. This entry was tagged Cootie Catchers, Riyadh, Saudi Arabia, خدمة سعوديةلعلاج قمل الرأس و إزالته 0. Bookmark the permalink.